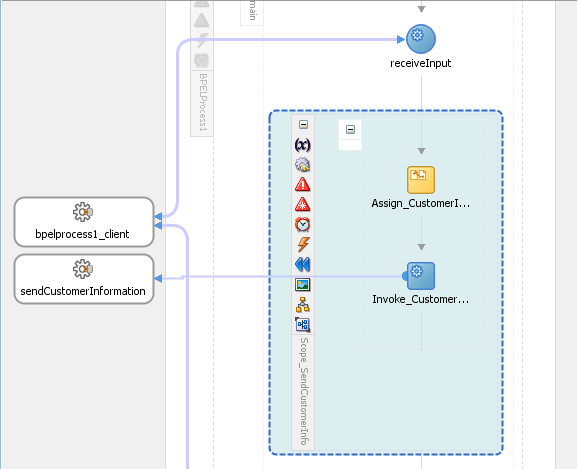 Custom activity template is one of template which is introduced in SOA 12c. We already discussed about Project and Component templates, if you missed my previous posts then you can click here to read about project template and click here to read about component template and see how to create and use both the templates. 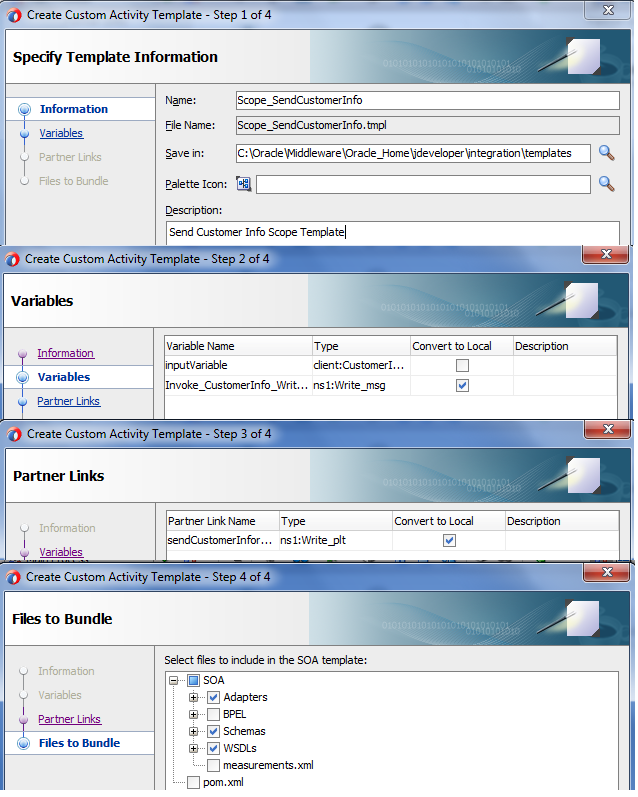 This post is specific to custom activity template; this template contains a scope activity of a BPEL process which may include assign, transform, invoke, and receive and partnerlink. 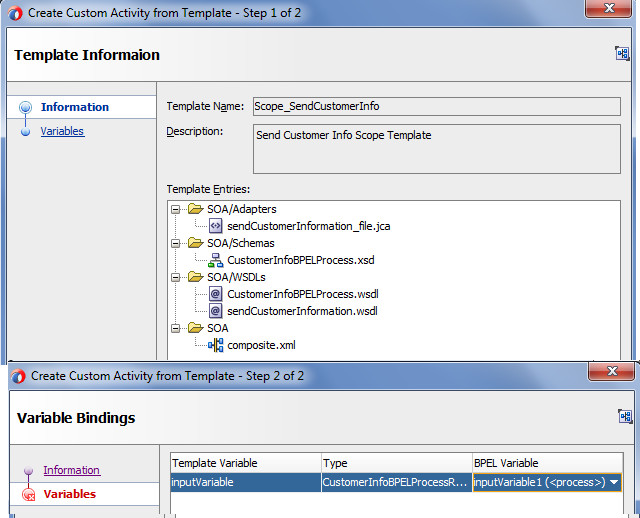 Custom activities templates will be available there in the BPEL palette under “Custom Activity Templates”. 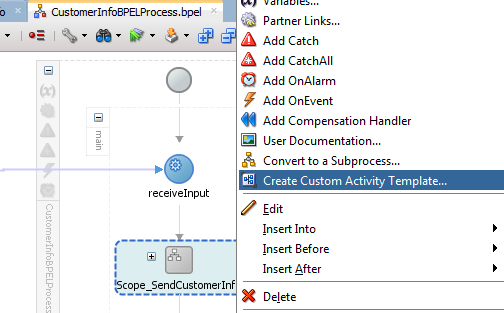 In this post, we discuss about how to create a custom activity template and how to use custom activity template in BPEL. 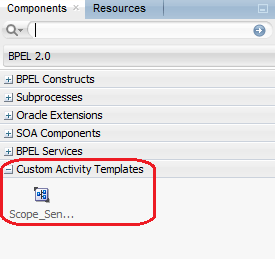 We use scope activity to create custom activity template for this post and later add that scope activity in another BPEL. We have built one sample composite, added one BPEL to it. In that BPEL we added one scope activity, inside that scope activity we have one invoke activity which is linked to file adapter and that file adapter writes the customer information file to local directory. We use this scope activity to create the custom activity template, to create custom activity template, right-click on the scope activity and choose “Create Custom Activity Template”. This opens template information wizard where we need to specify template information. Change the template and location if you want to, fill template description and click on next. In next step choose the variables which need to include in the template, once done click on next. In next step we choose all the partherlinks which we need inside this template, click on next and in the next or final step we see all the files which are there inside this template, you can also remove the files which you don’t need by click the checkbox, this will show file summary in below pane. Click on finish to create this template. Once you are done with custom activity template creation, you can see that custom activity template in component pallet under “Custom Activity Templates” option. This show all the available custom activity templates, currently we have only one so it show only one template. We created custom activity template in above part, where we follow certain steps and used scope activity to create a custom activity template. In this part we will see how to use above created custom activity template. As already mentioned above you can find all custom activity templates under “Custom Activity Templates” section in the component pallet. Now let’s see how to use this custom activity template. Drag the template from component pallet and drop it to the BPEL process. This opens custom activity template wizard, in first step, you can see all the files which are there inside this template, click on next. In next step you need to bind all the variables to existing variables if required. Click on finish, you see required scope get added to your BPEL along with all the references and components.